Virtually all international taxation provisions ultimately stem from two fundamental sources, both originating at the OECD: The Model Tax Convention (on which more than 3,000 bilateral tax treaties are based), and the Transfer Pricing Guidelines. During 2010, major revisions were made to both. how to perform a comparability analysis. This unique book provides an expert analysis of current, important topics in international taxation and transfer pricing. As such, it is a welcome and valuable resource for tax lawyers and consultants, corporate tax advisers, government officials and others involved in the international tax law market, as well as for academics and researchers in the field. Part II The new Article 7 of the OECD MC: Attribution of Profits to PE. Chapter 2 Article 7 – New OEVD Rules for Attributing Profit to Permanent Establishments Mary Bennett. Chapter 3 The 2010 Eliminination of Article 7-3 (1963): Rise and Fall of an Article Hans Pijl. Chapter 4 Attribution of Profits to PE: A Business Perspective Johan Muller. Part III Tax Treaty Entitlement of CIVs. Chapter 5 Charaterization and Tax Treaty Issues of Collective Investment Vehicles: A Review of the OECD Report and the 2010 Amendments to the Model Tax Convention Bruno da Silva. Chapter 6 Suggested Treaty Benefits Approaches for Collective Investment Vehicles ( CIVs) and Its Investors under the OECD MTC 2010 Update Hein Vermeulen. Chapter 7 The 2010 CIV-Report: A Comparison with the 1999 Partnership Report Ton Stevens. Part IV Income from Employment. Chapter 8 Updates to the Commentary on Article 15 of the OECD Model – Thoughts on the Interpretation of the Term ‘employer’ for Treaty Purposes Walter Andreoni. Chapter 9 Some Selected Interpretation and Qualification Issues with Respect to Article 15(2)(b) and (c) of the OECD Model Frank P.G. Pötgens . Part V The Revised Transfer Pricing Guidelines. 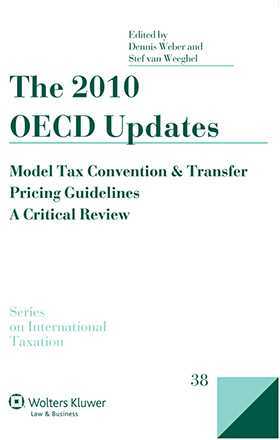 Chapter 10 The 2010 update to the OECD Transfer Pricing Guidelines Caroline Silberztein. Chapter 11 Chapters I and III of the 2010 OECD Guidelines: Capita Selecta Antonio Russo. Chapter 12 OECD Revision of Chapters I-III and IX of the Transfer Pricing Guidelines: Some Comments on Hierarchy of Methods and Re-characterization of Actual Transactions Undertaken Guglielmo Maisto. Part VI Sovereign Wealth Funds. Chapter 13 How to Treat(y) Sovereign Wealth Funds? The Application of Tax Treaties to State-owned Entities, including Sovereign Wealth Funds Stijn Jansen.